Yair Loewenson was born in Haifa, Israel, and has been playing, composing, and teaching music professionally since his late teens. Jazz has always been his main genre, along with late classical and contemporary compositions. His extensive track record on stage includes various ensembles: duets, trios, big-bands, and everything in between. 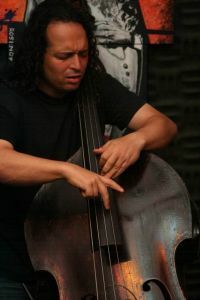 He performs in concerts and festivals in Israel and Europe and plays double bass, electric bass, and guitar. In 2008, he launched his debut trio album Room 13, which he has solely composed and produced. In August 2010 he recorded his next album "The Aquarium" at the Classical Studio. Like the previous album it is a modern Jazz piano trio, this time with Eran Talmor on the piano and Noam Israeli on the drums. The CD includes nine original tunes, one of them a composition by Eran Talmor. The CD Old Bottles New Wine featuring the legendary tenor sax player Mark Turner was released at 2015. In 2016 Yair was a guest of the Jazz faculty of the University of Delaware and performed in Philadelphia. A collaboration with American vibes player Harvey Price led to performances in Vienna and a CD that will be released soon. Yair is a co-founder at ToneLine, a company that provides music lessons at the Internet. We recorded one of my compositions at home. Eran Talmor used a software by Pianoteq. After sending the recorded piece to the company, they put it on their demo page: www.pianoteq.com/listen_modern. The title is: "leolam lo". Bass: I play electric bass since 1990. The bass is the first instrument that I performed with. These days I teach the bass to many students. My favorite bass players are: Jeff Berlin, Steve Swallow and Jaco Pastorius. Jeff Berlin is a very original player that got a unique voice on the instrument. I recommend his CD "Pump It". Steve Swallow: another great bassist and composer. I dig his solos and compositions and very muchrecommend his album "Home". Jaco Pastorius is the most popular bass player. He's a real revolutionist. I dig his sound and his great freedom and recommend listening to him on Weather Report CDs. Double Bass: I started playing the double bass in 1995. I love this instrument because of the possibility to use the bow, which makes the instrument sound like a wind instrument or a voice. The three players that are the most important for me are: Eddie Gomez, Ron Carter and Gary Peacock. Eddie Gomez has no limits on the bass. He can do everything. He got great solos with vocal quality. I recommend listening to him on Bill Evans' "You Must Believe in Spring". Ron Carter got a killer groove, great sound and the ability to build his lines like an architect. Listen to Ron carter on "Seven Steps to Heaven" of Miles Davis. Gary Peacock is a great soloist, a real artist with great taste. He can play with a lot of power and freedom. Listen to him on "Still Live" of Keith Jarret. Guitar: I started to play guitar proficiently in 2000 when I needed to play another instrument except the bass. These days I play guitar as much as I play the bass. I think that for me the most important influences are: Joe Pass, Jim Hall and Wes Montgomery. Joe Pass can do it all. He can play solo, he can play up tempo bop with no limits. I recommend his CD "Blues for Fred". Wes Montgomery got a great swing, big sound and flow. I recommend his album "Full House". Jim Hall is one of the most interesting guitar players. His sound is amazing and plays in a very interesting way. I recommend his CD "Circles".